A young Lankan computer animation specialist and film professional is to direct an ambitious new feature film which is all about space travel. 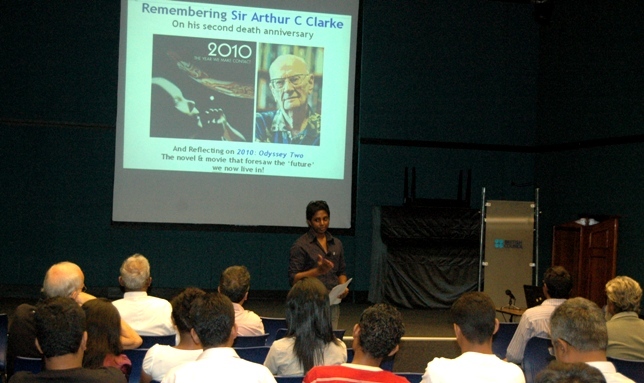 Thilanka Perera is teaming up his father, veteran TV and film professional Maheel R Perera, to adapt one of Sir Arthur C Clarke’s short stories, “Into the Comet”. 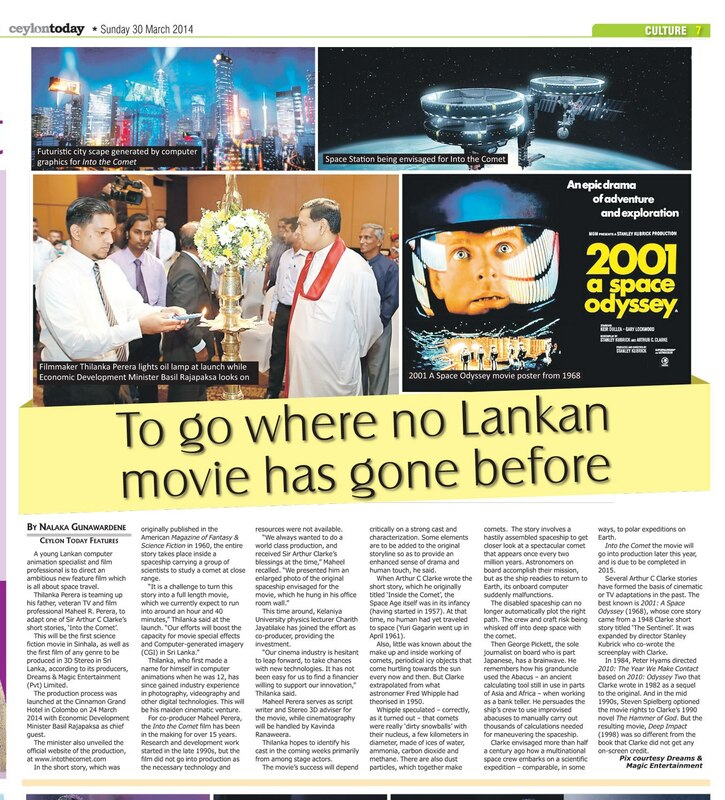 This will be the first science fiction movie in Sinhala, as well as the first film of any genre to be produced in 3D Stereo in Sri Lanka, according to its producers, Dreams & Magic Entertainment (Pvt) Limited. 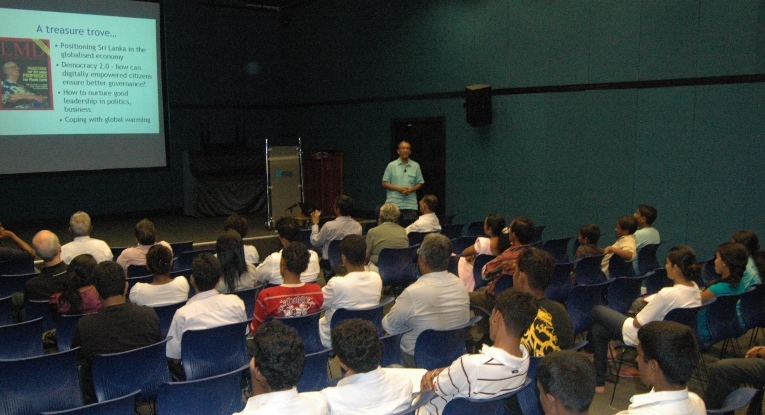 The production process was launched at the Cinnamon Grand Hotel in Colombo on 24 March 2014 with Economic Development Minister Basil Rajapaksa as chief guest. In the short story, which was originally published in the American Magazine of Fantasy & Science Fiction in 1960, the entire story takes place inside a spaceship carrying a group of scientists to study a comet at close range. 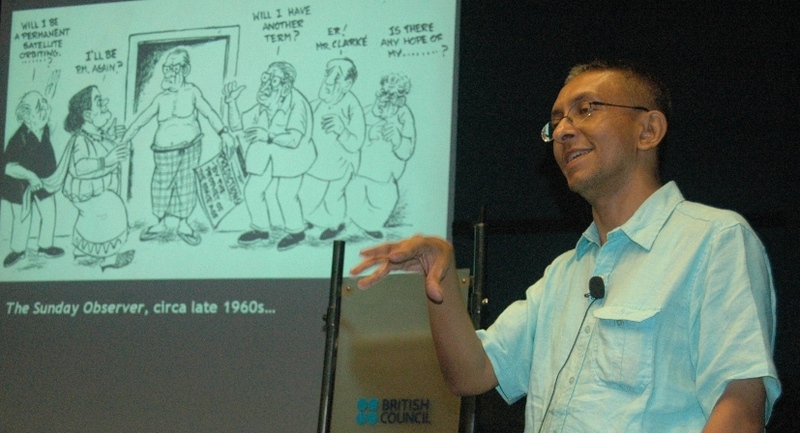 Thilanka, who first made a name for himself in computer animations when he was 12, has since gained industry experience in photography, videography and other digital technologies. This will be his maiden cinematic venture. For co-producer Maheel Perera, ‘Into the Comet’ film has been in the making for over 15 years. Research and development work started in the late 1990s, but the film did not go into production as the necessary technology and resources were not available. This time around, Kelaniya University physics lecturer Charith Jayatilake has joined the effort as co-producer, providing the investment. “Our cinema industry is hesitant to leap forward, to take chances with new technologies. It has not been easy for us to find a financier willing to support our innovation,” Thilanka said. 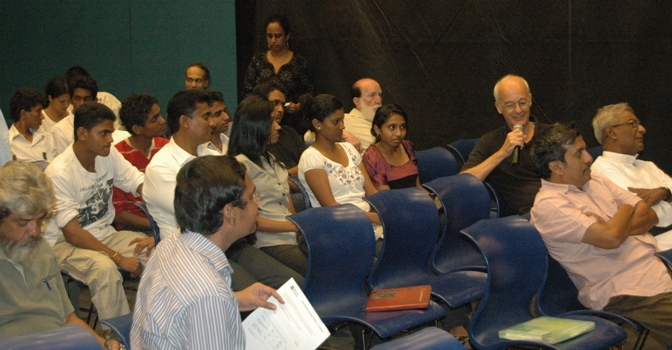 Maheel Perera serves as script writer and Stereo 3D adviser for the movie, while cinematography will be handled by Kavinda Ranaweera. Thilanka hopes to identify his cast in the coming weeks primarily from among stage actors. The movie’s success will depend critically on a strong cast and characterization. Some elements are to be added to the original storyline so as to provide an enhanced sense of drama and human touch, he said. When Arthur C Clarke wrote the short story, which he originally titled “Inside the Comet”, the Space Age itself was in its infancy (having started in 1957). At that time, no human had yet traveled to space (Yuri Gagarin went up in April 1961). Also, little was known about the make up and inside working of comets, periodical icy objects that come hurtling towards the sun every now and then. But Clarke extrapolated from what astronomer Fred Whipple had theorised in 1950. 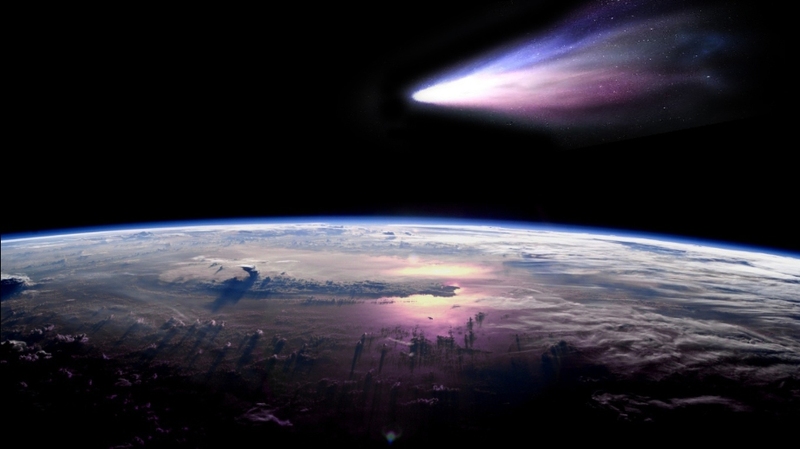 Whipple speculated — correctly, as it turned out — that comets were really ‘dirty snowballs’ with their nucleus, a few kilometers in diameter, made of ices of water, ammonia, carbon dioxide and methane. There are also dust particles, which together make comets spectacular phenomena when they approach the sun. The story involves a hastily assembled spaceship to get closer look at a spectacular comet that appears once every two million years. Astronomers on board accomplish their mission, but as the ship readies to return to Earth, its onboard computer suddenly malfunctions. The disabled spaceship can no longer automatically plot the right path. The crew and craft risk being whisked off into deep space with the comet. Clarke envisaged more than half a century ago how a multinational space crew embarks on a scientific expedition – comparable, in some ways, to polar expeditions on Earth. “Into the Comet” the movie will go into production later this year, and is due to be completed in 2015. Several Arthur C Clarke stories have formed the basis of cinematic or TV adaptations in the past. The best known is 2001: A Space Odyssey (1968), whose core story came from a 1948 Clarke short story titled ‘The Sentinel’. It was expanded by director Stanley Kubrick who co-wrote the screenplay with Clarke. In 1984, Peter Hyams directed 2010: The Year We Make Contact based on 2010: Odyssey Two that Clarke wrote in 1982 as a sequel to the original. And in the mid 1990s, Steven Spielberg optioned the movie rights to Clarke’s 1990 novel The Hammer of God. But the resulting movie, Deep Impact (1998) was so different from the book that Clarke did not get any on-screen credit. See also – 2 January 2010: 2010: The Year We Make Contact…? 2010: The Year We Make Contact…? We apologise for the delayed arrival of the future? The year 2010 has finally arrived, but as they often say in the imagination business, the future isn’t what it used to be. 2010 holds a special significance for science fiction and movie buffs because both a well known novel and a movie have been set in that year by the grandmaster of near-future imagination, Arthur C Clarke. 2010: Odyssey Two is a best-selling science fiction novel by Clarke, published in January 1982. It was a sequel to 2001: A Space Odyssey. The story is about seven Russians and three Americans who embark on a joint space mission to Jupiter to figure out what happened to the previous Jupiter mission nine years earlier. They start off as acquaintances and end up as friends – the author hoped that would help improve understanding between the US and the USSR. The book was dedicated to celebrated cosmonaut Alexei Leonov and Andrei Sakharov, physicist, Nobel laureate and humanist, whose outspoken views led to his internal exile in Gorky until 1986. The novel was adapted as a movie by Peter Hyams and released in 1984. Its promotional title was 2010: The Year We Make Contact! (although this never appears in the film itself.) Unlike 2001: A Space Odyssey, the novel and the screenplay were not written simultaneously, and there are significant differences between the two. According to the Wikipedia, the film was only a moderate success, disappointing many critics as well as viewers. If nothing else, the book and movie of 2010 remind us how difficult it is to write near-future stories — most of them are completely overtaken by reality. Several elements in 2010 have become anachronistic in the years following their original release. The most striking is the end of the Cold War and the disintegration of the once mighty Soviet Union (which ceased to exist in 1991). Interestingly, he had peppered the novel with names of various Soviet dissidents, including physicists Andrei Sakharov and Yuri Orlov, human-rights activists Mykola Rudenko and Anatoly Marchenko, Russian Orthodox activist Gleb Yakunin, among others. That was the author’s not-so-subtle jibe at the Soviet Union, despite the fact that he was both admired and respected in the country that pioneered humanity’s entry into space. That’s when Leonov, Hero of the Soviet Union and one of its most decorated citizens, told off the Central Committee: “You aren’t worth the nail on Arthur C. Clarke’s little finger.” This was revealed years later in Two Sides of the Moon: Our Story of the Cold War Space Race, co-authored by Alexei Leonov and American astronaut David Scott (Simon and Schuster, 2004). 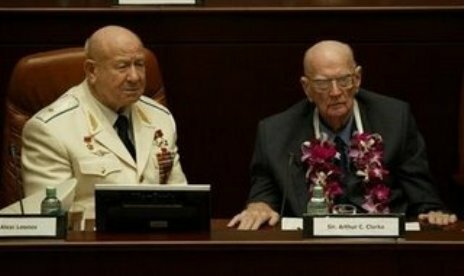 As Sir Arthur – a long standing friend of Leonov – remarked in a review of their book, Leonov was “perhaps the only man in the USSR who could have got away with that kind of remark”. Who can predict what surprises await us as the real 2010 unfolds? Lights, Camera, Apollo: Did NASA and Hollywood co-produce Moon Landings? Is this how it really happened? Just kidding! When NASA announced last week that they were working with a leading digital imaging company in Hollywood to remaster the original Apollo 11 Moon walk video footage, I told myself: that’s one more cannon to the conspiracy theorists! Everyone would welcome a quality improvement in those murky, grainy moving images capturing humanity’s grand achievement. But the choice of Lowry Corporation, best known for restoring old Hollywood films, could fuel the fire of conspiracy theorists who argue that the entire Moon landing was faked by NASA with the connivance and participation of Hollywood. They believe that the entire Apollo programme – that landed people on the moon six times between 1969 and 1972 – was staged on a movie set or secret military base. This link didn’t bother Richard Nafzger, the NASA engineer who oversaw television processing at the ground-tracking sites during the Apollo 11 mission, and now involved in their restoration. “This company is restoring historic video. It mattered not to me where the company was from,” Nafzger was quoted as saying. In another place, NASA website says Moon rocks and common sense prove Apollo astronauts really did visit the Moon. Err, Wasn't Spielberg only 23 at the time...? Independent scientists point out that it would be impossible for tens of thousands of NASA employees and Apollo contractors to keep such a whopping secret for almost four decades. Tell that to those who are deeply suspicious of anything to do with governments, who historically don’t have the best record for transparency and full disclosure! So the conspiracy theory lingers. Like many other crazy ‘theories’, it has spread rapidly with the growth of the Internet. It’s really an old one: even at the time Apollo astronauts landed on the Moon, a few people refused to believe it as it apparently conflicted with their religious beliefs. The Moon Hoax, as it’s popularly called, accuses NASA of manufacturing, destroying, or tampering with evidence — including photos, telemetry tapes, transmissions, and rock samples; and that the deception continues to this day. These theorists concede that the Apollo launches did take place. But instead of going to the Moon, which they say was technologically impossible at the time, the astronauts just orbited the Earth for a few days while NASA carefully fed the media with manufactured images. And then they returned to a heroes’ welcome! Some believe that these theories inspired the 1978 movie Capricorn One, where NASA fakes a Mars landing on a military base on Earth, and then goes to desperate lengths to cover it up. It’s entirely possible that some people can’t discern fact from fiction. Or why allow facts to get in the way of a damn good story? In 1980, the Flat Earth Society was one of the first to accuse NASA of faking the Moon landings, arguing that these events were actually staged in Hollywood studios and based on a script written by Arthur C. Clarke! Another group suggested that acclaimed film director Stanley Kubrick, who co-wrote with Clarke the classic movie 2001: A Space Odyssey, was strong-armed into shooting much of the Apollo footage. 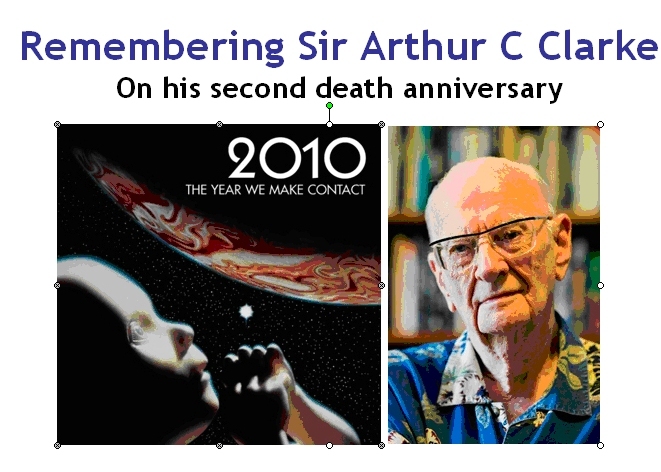 Sir Arthur Clarke, with whom I worked for over 20 years, used to laugh these off. He’d enjoyed a ring side seat when he joined Walter Cronkite in covering Apollo 11 and later missions for CBS News. Of course, he never received – nor expected – a reply. But when media reports about this appeared, some with no sense of humour considered it further ‘proof’ of a cover-up! And here’s another connection: Peter Hyams, who directed Capricorn One, went on to direct the movie adaptation of Arthur C Clarke’s 2010: Odyssey Two, which was released in 1984. More seriously, in later years Sir Arthur was concerned that at one point a few years ago, millions of Americans harboured doubts whether the Moon landings actually took place. That indicated a failure of the education system to produce people with critical thinking abilities, he said. Conspiracy Theory: Did We Land on the Moon?. Hosted by X-Files actor Mitch Pileggi, this hour-long, sensational documentary peddled what it called eerie “inconsistencies” in NASA’s Apollo images and TV footage. Among them: no blast craters are visible under the landing modules; shadows intersect instead of running parallel, suggesting the presence of an unnatural light source; and a planted American flag appears to ripple in a breeze although there’s no wind on the moon. It concluded that the whole Apollo Moon landings were faked in the Nevada desert because, cccording to the conspiracy theorists, NASA did not have the technical capability of going to the Moon, but pressure due to the Cold War with the Soviet Union forced them to fake it. Fox TV did preface the programme with a notice saying: “The following programme deals with a controversial subject. The theories expressed are not the only possible interpretation. Viewers are invited to make a judgement based on all available information.” But skeptics felt Fox didn’t do enough to provide a minimum level of balance in their discussion. The documentary’s ‘evidence’ has since been refuted point by point. NASA has also dismissed the documentary’s claims. It prompted Sir Arthur Clarke to protest to his long-time friend Rupert Murdoch, owner of the Fox TV network, for peddling unscientific nonsense. Rather than being a ‘true believer’, Fox TV may have been trying to boost its audience ratings. But others in the moving images industry apparently take the matter very seriously. Among them is the film-maker Bart Sibrel. His aggressive interview tactics once provoked astronaut Buzz Aldrin (second man to walk on the Moon) to punch him in the face in a 2002 encounter. One of the strongest rebuttals of the Moon hoax on TV has come from the Mythbusters series of popular science programmes produced by Beyond Television Productions, originally for the Discovery Channel. The series features special effects experts Adam Savage and Jamie Hyneman, who use basic elements of the scientific method to test the validity of various rumors, myths, movie scenes, internet videos and news stories in popular culture. Read Space.com coverage about how Mythbusters busted the Moon Hoax. As the 40th anniversary of the first Moon landing passes, the scientific community and rationalists will have to make some hard choices. How much more time and energy must they expend countering such wildly fanciful theories and fantasies? In a world that still has a (dwindling?) number of people who believe in more ancient concepts like the Flat Earth theory, is it really surprising that the Space Age would inspire its own share of modern-day myths? No matter what the scientists say and how overwhelming the evidence is, conspiracy theories will always believe what they want. Often their convictions border on a blind faith – and as Arthur C Clarke was fond of saying (in relation to religions), one definition of faith is ‘believing in what you know isn’t true!’. Then there is simple demographics. The total world population in 1969 was 3.6 billion. Today, it has surpassed 6.7 billion. This means nearly half of the people alive today were not even born when Neil and Buzz stepped on to the Moon. At 43, even I have only a headline memory of Apollo 11, even if it’s a strong one. Perhaps what the Moon Hoax debate really needs is what Sir Arthur Clarke once proposed as a response to the obsession with UFOs and alien abductions: a decade or so of benign neglect. Conspiracy theorists and myth-makers thrive on counter-arguments and debate. When they don’t get it for long enough, they’ll probably run out of steam. Meanwhile, networks like Fox News should stick to making entertainment programming that is labeled as such. Who can find fault with creations like The Simpsons?